I love the smell of drying glue, melted crayons and cupcakes! It’s a unique fragrance that I associate with VBS, one of my favorite ministry events. Like many churches, we open our daily VBS meetings with pledges to the Bible and the Christian flag. Our opening procedures are simple and we work hard to include everyone. Every day, we select different children to hold the flags and the Bible as we make our pledges. If you have large flags mounted in heavy stands, you could select children to come stand next to the flag, as an example of how to pledge. If you prefer, get the full sized and bookmark download all the VBS pledges (Bible, Christian Flag, American Flag) in one printable file plus bookmark version. Have the child lay the Bible on a table or stand. 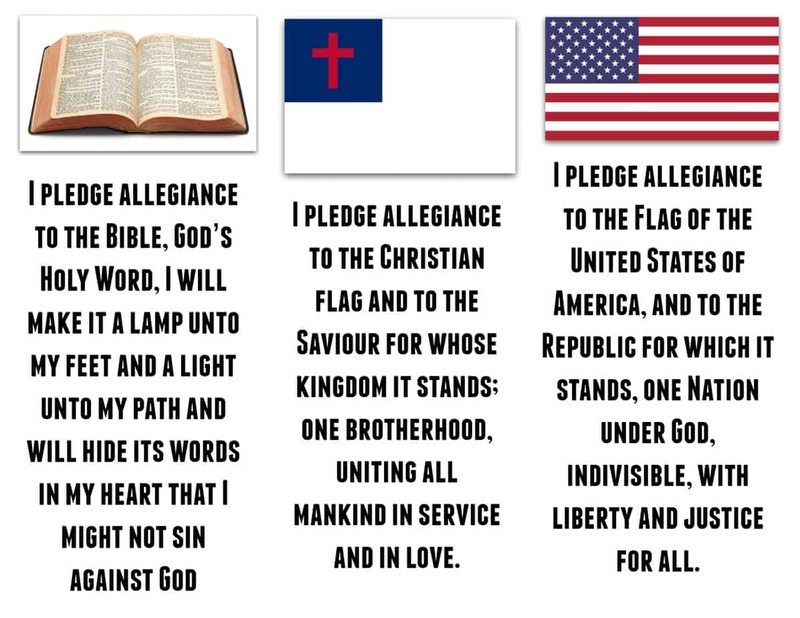 I pledge allegiance to the Christian flag and to the Saviour for whose kingdom it stands; one brotherhood, uniting all mankind in service and in love. Pledge to the American Flag: We have a lot of military families in our congregation, plus we are a patriotic group. We include the pledge to the American flag out of respect for our country. Many children are familiar with the pledge. Everyone should stand and place the right hand over the heart. International readers should use their own national flag or omit this step. Lead the pledges at the beginning of the day, before your breakout classes. Besides teaching children to respect the flags and the Bible, these procedures will establish order at your VBS. Have a fun time! One brotherhood uniting all Christians in service and love. 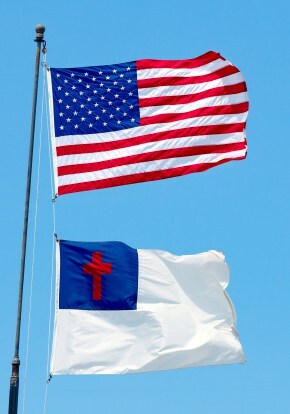 To bad more people don’t pledge their allegiance to the Christian flag and Bible, the world would be a better place. Thanks for your input. Got the kids in my Sunday School class little Christian Flags for the 4th of July with a print out of the pledge (never seen the “one brotherhood uniting all Christians in service and love” part, but it does sound good.) I’ll keep to the original pledge…. When you pledge to the Bible, What posture do you take, other than standing? Is your hand over your heart, open-face up or down by your side? Tony Kummer (Editor) reviewed & updated this page on : July 22, 2017 at 9:52 am. All our content is peer reviewed by our readers, simply leave a comment on any post suggest an update.